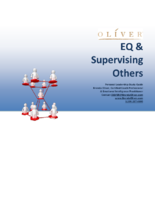 Supervising others can be a tough job. Between managing your own time and projects, helping your team members solve problems and complete tasks, and helping other supervisors, your day can fill up before you know it. This 34 page self-study guide will help you become more proficient with delegating, managing time, setting goals and expectations, providing feedback, resolving conflict, and administering discipline.